Lauricidin® is pure sn-1 monolaurin (glycerol monolaurate) derived from coconut oil. The same monolaurin received from mother’s milk, saw palmetto, and bitter melon – embraced by both your immune system† and your digestive tract†. Lauricidin® is intended to be taken daily like a multi-vitamin for at least three-six months at the recommended intake to support general immune health* and overall wellness†. Lauricidin® is intended to be taken for long-term support of general health and wellness and not intended to treat, diagnose, cure or prevent any disease. Our monolaurin is a natural, plant-based medium chain saturated fatty acid extracted from coconut oil that offers unique health-promoting properties†. Adults —– Take with or after meals. The mini-pellets can be placed in the mouth and swallowed with water or juice. Do not take with hot liquids. Do not chew or take as a powder. The recommended initial level of Lauricidin® is ~0.75 gram (1/4 blue scoop) or less two or three times daily for a week before increasing the amount. The level can be then increased to 1.5 grams (1/2 blue scoop) one, two or three times daily thereafter. For individuals ages 12 and older, start with 1/4th of a teaspoon (1/4th of the blue scoop) two to three times a day with food, and slowly work up to 1 teaspoon (1 full blue scoop) two to three times a day with food. We recommend not exceeding 12 teaspoons (12 full scoops) per day and always to start low and increase intake slowly. Children three years and older may start with as low as 1-5 pellets and work up the intake more slowly. Lauricidin® is a pure lipid extract and has a natural bitter, soap-like taste to it. We recommend simply washing down the Lauricidin® pellets with cool water or juice which is associated with little to no taste. Lauricidin® containers may contain varying levels of residual powder that may leave a very mild taste in the mouth that is not harmful. Lauricidin® is nontoxic. If starting levels are too high, a patient may experience short-term (a few days to a few weeks) exacerbation of mild symptoms such as headache, joint and muscle pain, body aches, acne, itchy skin, mild rashes, skin flushing, sore throat, general malaise, sweating, chills, nausea, or other symptoms. This mild and temporary response may be likened to what is known as a Jarisch-Herxheimer reaction. These symptoms are normal – and even healthy. Questions should be directed to your health professional and your intake level may need to be lessened. Lauricidin® is intended to be taken daily like a multi-vitamin for at least three-six months at the recommended intake to support general immune health* and overall wellness†. Coconut oil is the edible oil harvested from the meat of mature coconuts (Cocos nucifera). 40-60% of coconut oil is comprised of the 12-carbon medium chain saturated fatty acid known as lauric acid, a triglyceride. Lauricidin® is made by combining lauric acid from coconut oil with a plant-based glycerol (non-soy) creating a pure ester known as monolaurin, a monoglyceride. Lauricidin® is intended to be taken for long-term support of general health and wellness and not intended to treat, diagnose, cure or prevent any disease. It may take a few weeks or months to work up to the maintenance intake of one teaspoon (1 full blue scoop) three times per day. When taken on an ongoing basis, Lauricidin® may help support a strong immune defense†, support a natural balance of healthy bacteria†, and promote a healthy balance of yeast†. No. The usual 300 mg capsule contains in addition to 300mg monolaurin, a base of inosine 7.5 mg and calcium-phosphate 106 mg with inert ingredients: dicalcium-phosphate, cellulose-powder and silicon-dioxide. 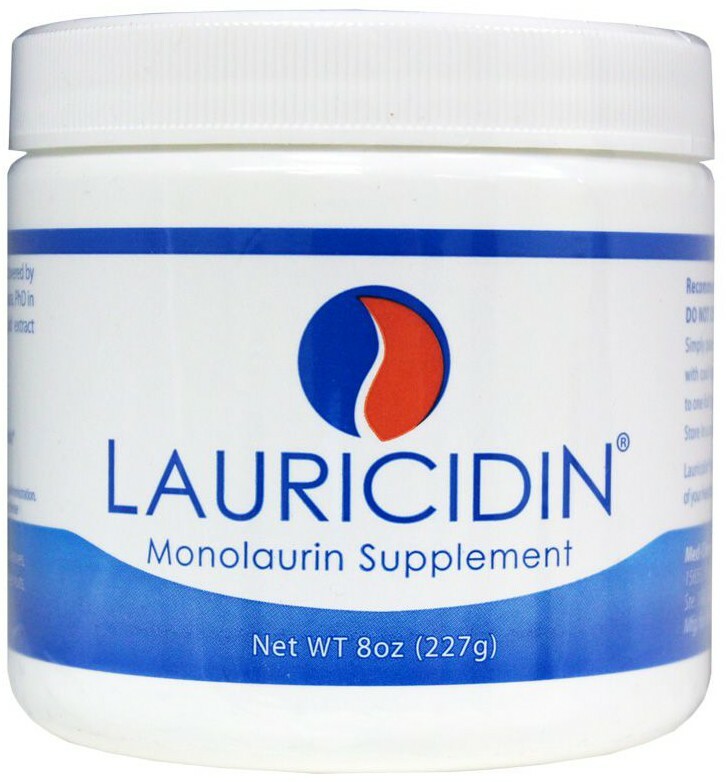 Lauricidin®, on the other hand, is the purest monolaurin commercially attainable and is without any fillers or allergens. The shelf-life of Lauricidin® is two years upon manufacture. Many natural products have an expiration date of just one year.